ASIS&T Best Information Science Book award 2011: "We consider it to be a spectacular achievement not only because it is the result of a prodigious amount of scholarly work of the highest quality, and because its subject matter is absolutely central to the interests of ASIS&T and its community, but also because of the work's visual qualities and high production value, which will ensure that it will be widely read beyond the IS field." Shneiderman, Ben. 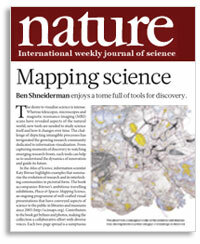 Mapping science: Ben Shneiderman enjoys a tome full of tools for discovery. Nature. Dec 23, 2010. Rankin, William J. Visualizing Disciplines, Transforming Boundaries. American Scientist. May 5, 2011. Leydesdorff, Loet. 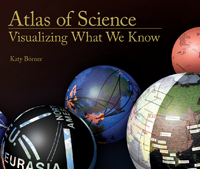 Katy Börner: Atlas of science: visualizing what we know. June 6, 2011. Markoff, John. Digging Deeper, Seeing Farther: Supercomputers Alter Science. 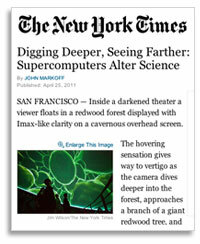 New York Times, April 25, 2011. Whitfield, John. (2008). 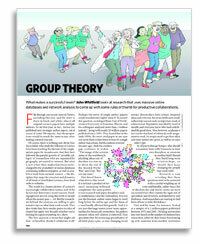 Group Theory. In Nature. Vol. 455, 720-723. 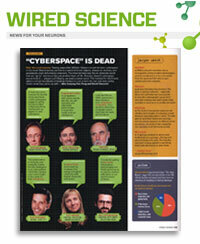 Pang and Pescovitz (2006) “Cyberspace” is Dead, Wired 14.02. ISSUES in Science and Technology. Spring 2011. 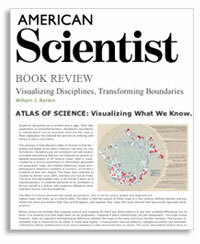 Atlas of Science (special feature). Busmann, Johannes, ed. 2010. Exploring Spaces: Projekte für die Zukunft. Polis: Magazin für Urban Development. Herr, II, Bruce W., Todd M. Holloway, Katy Börner. 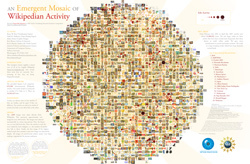 An Emergent Mosaic of Wikipedian Activity. 2007. In Wikimedia Foundation. 2008. Annual Report, p. 24. Holloway, Todd, Božicevic, Miran and Börner, Katy. 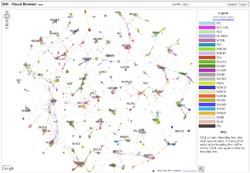 (2007) Analyzing and Visualizing the Semantic Coverage of Wikipedia and Its Authors. Complexity, Special issue on Understanding Complex Systems. 12(3), pp. 30-40. Ke, Weimao and Börner, Katy. (2005). Mapping the Social Network and Expertise of "Network Science" Researchers. 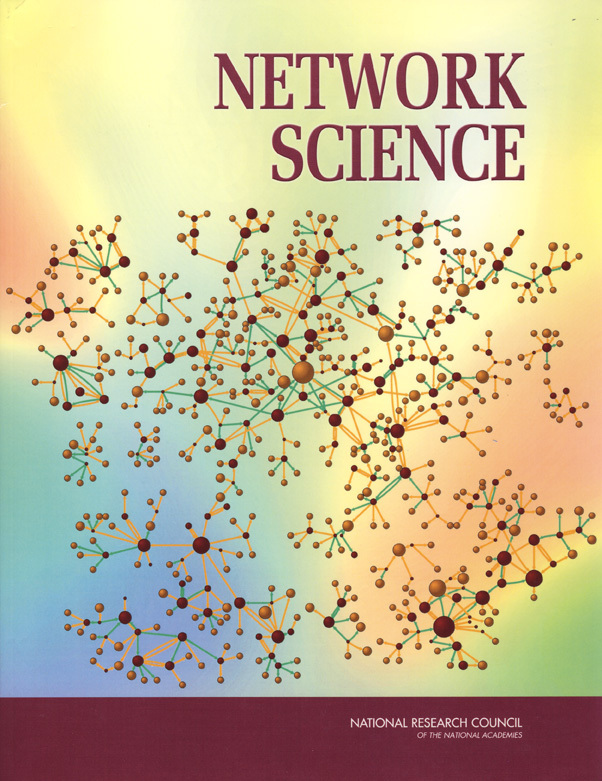 Report to the U.S. National Research Council study on Network Science. Katy Börner is the Victor H. Yngve Professor of Information Science in the Department of Information and Library Science, School of Informatics and Computing, Adjunct Professor at the Department of Statistics in the College of Arts and Sciences, Core Faculty of Cognitive Science, Research Affiliate of the Center for Complex Networks and Systems Research and Biocomplexity Institute, Member of the Advanced Visualization Laboratory, Leader of the Information Visualization Lab, and Founding Director of the Cyberinfrastructure for Network Science Center at Indiana University in Bloomington, IN and Visiting Professor at the Royal Netherlands Academy of Arts and Sciences (KNAW) in The Netherlands. 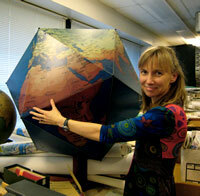 She is a curator of the international Places & Spaces: Mapping Science exhibit. She holds a MS in Electrical Engineering from the University of Technology in Leipzig, 1991 and a Ph.D. in Computer Science from the University of Kaiserslautern, 1997. She became an American Association for the Advancement of Science (AAAS) Fellow in 2012. Katy's research focuses on the development of data analysis and visualization techniques for information access, understanding, and management. She is particularly interested in the study of the structure and evolution of scientific disciplines; the analysis and visualization of online activity; and the development of cyberinfrastructures for large scale scientific collaboration and computation. 2014: Atlas of Knowledge, MIT Press. 2011: Models of Science Dynamics, Springer. 2009: Data on Federal Research and Development Investments: A Pathway to Modernization, NAS. 2003: Visual Interfaces to Digital Libraries, Springer. Skupin, André, Joseph R. Biberstine, and Katy Börner. (2013) Visualizing the Topical Structure of the Medical Sciences: A Self-Organizing Map Approach. PLoS ONE 8 (3): e58779. Börner, Katy, Klavans, Richard, Patek, Michael, Zoss, Angela, Biberstine, Joseph R., Light, Robert, Larivière, Vincent, and Boyack, Kevin W.. (2012). Design and Update of a Classification System: The UCSD Map of Science. PLoS One 7(7): e39464. Börner, Katy. (2011). Plug-and-Play Macroscopes. Communications of the ACM. Vol. 54(3), 60-69, ACM Press. Boyack, Kevin W., Newman, David, Duhon, Russell Jackson, Klavans, Richard, Patek, Michael, Biberstine, Joseph R., Schijvenaars, Bob, Skupin, Andre, Ma, Nianli & Börner, Katy. (2011). Clustering More Than Two Million Biomedical Publications: Comparing the Accuracies of Nine Text-Based Similarity Approaches. PLoS ONE. Vol. 6(3), 1-11. Börner, Katy, Contractor, Noshir S., Falk-Krzesinski, Holly J., Fiore, Stephen M., Hall, Kara L., Keyton, Joann, Spring, Bonnie, Stokols, Daniel, Trochim, William & Uzzi, Brian. (2010). A Multi-Level Systems Perspective for the Science of Team Science. In Science Translational Medicine. Vol. 2(49), 49(cm)24. Börner, Katy, Sanyal, Soma & Vespignani, Alessandro. (2007). Network Scienc. In Cronin, Blaise (Eds. ), Annual Review of Information Science & Technology (Vol. 41, pp. 537-607), chapter 12, Medford, NJ: Information Today, Inc./American Society for Information Science and Technology. Börner, Katy, Chen, Chaomei & Boyack, Kevin W. (2003). Visualizing Knowledge Domains. In Cronin, Blaise (Eds. ), Annual Review of Information Science & Technology (Vol. 37, pp. 179-255), chapter 5, American Society for Information Science and Technology, Medford, NJ. Börner, Katy, Maru, Jeegar & Goldstone, Robert. (2004). The Simultaneous Evolution of Author and Paper Networks. Proceedings of the National Academy of Sciences of the United States of America. Vol. 101, 5266-5273. Mane, Ketan K. & Börner, Katy. (2004). Mapping Topics and Topic Bursts in PNAS. Proceedings of the National Academy of Sciences of the United States of America. Vol. 101, 5287-5290. Börner, Katy, Glänzel, Wolfgang, Scharnhorst, Andrea & van den Besselaar, Peter (Eds. ), Modeling science: studying the structure and dynamics of science. (2011). Scientometrics, Springer. Börner, Katy & Scharnhorst, Andrea (Eds. 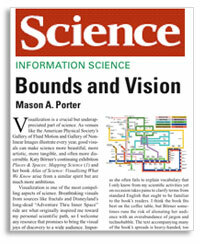 ), Visual Conceptualizations and Models of Science. (2009). Special Issue on the Science of Science: Conceptualizations and Models of Science, Journal of Informetrics, Vol. 3(3), Elsevier. Skupin, Andre & Börner, Katy (Eds. ), Special Issue on Mapping Humanity's Knowledge and Expertise in the Digital Domain. (2007). Environment and Planning B: Planning and Design, Vol. 34(5), Pion. Börner, Katy & Navarro-Prieto, Raquel (Eds. 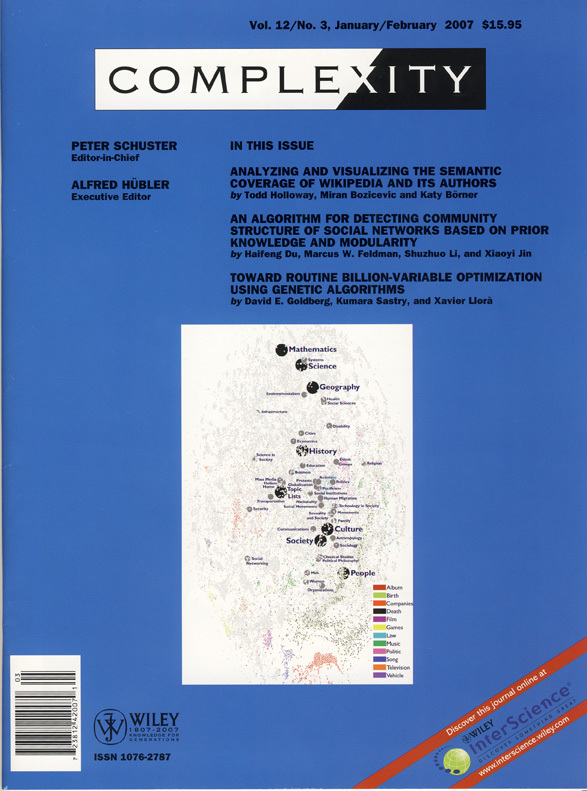 ), Special Issue on Collaborative Information Visualization Environments. (2005). PRESENCE, Vol. 14(1), MIT Press. Börner, Katy & Mostafa, Javed (Eds. ), Special Issue on Information Visualization Interfaces for Retrieval and Analysis (2005), International Journal on Digital Libraries, Vol. 5(1), Springer-Verlag. Shiffrin, Richard & Börner, Katy (Eds. ), Mapping Knowledge Domains. (2004). Proceedings of the National Academy of Sciences of the United States of America, Vol. 101(Suppl. 1). Katy Börner's TEDx Bloomington talk on Maps & Macroscopes -- Gaining Insights from BIG Data. March 2013. Katy Börner is featured in FuturICT - New Science and Technology to Manage Our Complex, Connected World. Oct 2011. Katy Börner presents Plug-and-Play Macroscopes. Communications of the ACM. March 2011. Katy Börner presents Scholarly Data, Network Science and (Google) Maps at Google, Inc., Mountain View California. Jan 2007. The international Places & Spaces: Mapping Science exhibit was created in 2005 to introduce maps of science in support of the navigation, management, understanding, and communication of data, knowledge, and expertise. As of 2011, the exhibit features 70 maps by 189 authors from 11 countries. Each year, a new themed set of 10 maps is added via an open call for maps and peer review by the exhibit advisory board and invited experts. Over the last 7 years, the exhibit has been on display at more than 200 venues in 19 countries on 6 continents. Scholarly Database with 25 million paper, patent, and grant records; supports cross-search, downloads of data tables and co-author, patent-citation, and other networks in easy to process formats. Cyberinfrastructure Shell: Supports the plug-and-play of datasets and algorithms and their bundling into custom tools that serve the specific needs of a user group or research community. 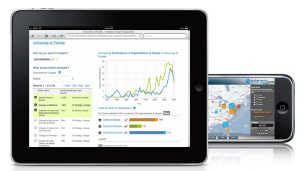 Eight scientific communities are using OSGi/CIShell powered tools. Network Workbench Tool: Downloaded more than 100,000 times by researchers, educators, and practitioners interested in the study of biomedical, social and behavioral science, physics, and other networks. (User Manual). Science of Science (Sci2) Tool: Developed for science policy makers and researchers that study science by scientific means. Supports temporal, geospatial, topical, and network analysis and visualization of scholarly datasets at the micro (individual), meso (local), and macro (global) levels. (User Manual, Sci2 Tool wiki, and 24 hours of NIH tutorials). The tool is used by the National Science Foundation, the National Institutes of Health, the U.S. Department of Agriculture, and the National Oceanic and Atmospheric Administration. Spin-off Company: Former CNS students/staff created http://chalklabs.com in 2009. Aug 24, 2011: Katy Börner, Chintan Tank & Chinhua Kong present Visualization in VIVO: A case study in how VIVO data and technology can be used at Second Annual VIVO Conference, Washington, DC. Jul 04, 2011: Katy Börner presents Sci2: A Tool of Science of Science Research and Practice at 13th ISSI Conference 2011, Durban, South Africa. 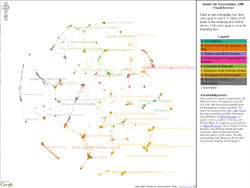 Aug 17, 2011: Scott B. Weingart & Katy Börner present Preparing, Analyzing and Visualizing Humanities Data at Networks and Network Analysis for Humanities: An NEH Institute for Advanced Topics in Digital Humanities, IPAM, UC Los Angeles, CA. Apr 25, 2013 DASER talk at NAS, Washington, DC. Mar 22, 2013 TEDx at Buskirk-Chumley Theater in Bloomington, IN. Jan 24, 2013 "Visualizing What We Know" Talk using Betazone at WEF, Davos. Humanexus semidocumentary animation shows at SoFA Revisited, IUB. Spring Data Visualization Literacy Workshop @ CNS, IUB. Nov 3-4 Plug-and-Play Macroscopes Workshop @ CNS, IUB. NARCIS: Network of Experts and Knowledge Organizations in the Netherlands, for Data Archiving and Networked Services (DANS), Royal Netherlands Academy of Arts and Sciences (KNAW), by Linda Reijnhoudt, Michael J. Stamper, Katy Börner, Chris Baars, and Andrea Scharnhorst. Chin Hua Kong, Katy Börner, and Michael J. Stamper (2011) Mendeley's Evolving Network of Expertise and Knowledge, 2011 Mendeley Binary Battle. Michael J. Stamper (2011) Sources and Sinks of Life Time in U.S. Air Travel, Sunbelt Conference. Angela Zoss and Katy Börner (2010) U.S. Job Market: Where are the Academic Jobs?, 6th Iteration of Places & Spaces: Mapping Science exhibition. Joseph Biberstine, Russell J. Duhon, Katy Börner, Elisha Hardy, and André Skupin (2010) A Semantic Landscape of the Last.fm Music Folksonomy using a Self-Organizing Map, Sunbelt Conference. 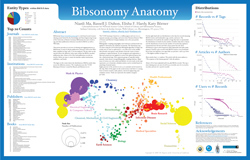 Nianli Ma, Russell J. Duhon, Elisha F. Hardy, Katy Börner (2009) Bibsonomy Anatomy, Sunbelt Conference. Weixia (Bonnie) Huang, Russell J. Duhon, Elisha F. Hardy, Katy Börner (2008) Research Collaborations by the Chinese Academy of Sciences. Exhibit Display at NSLC, CAS, China. Bruce Herr, Weimao Ke, Elisha Hardy, Katy Börner (2007) Movies and Actors. Bruce W. Herr II, David Newman, Gully APC Burns (2007) A Map of NIH-funded Grants from 2007. Bruce W. Herr II, David Newman, Gully APC Burns (2007) Society for Neuroscience, 2006 Visual Browser.